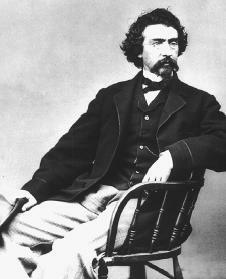 Mathew B. Brady (he never knew what the initial "B" stood for) was born in Warren County, New York. The exact place and year are not known. In later life Brady told a reporter, "I go back near 1823–24." Not much more is known of his parents, Andrew and Julia Brady. Mathew spent his youth in Saratoga Springs, New York, and became a friend of the painter William Page, who was a student of the painter and inventor Samuel F. B. Morse (1791–1872). Around 1839 Brady went to New York City with Page. Nothing certain is known of his activity there until 1843, when the city directory listed his occupation as a jewel-case manufacturer. The process of creating daguerreotypes (a form of photograph in which the picture was formed on metal) had been introduced to America in 1839, and Morse became one of the first to practice the craft and to teach it. Brady met Morse through Page, and he learned to take daguerreotypes from him. In 1843 Brady added cases specially made for daguerreotypes to his line of goods, and a year later he opened a successful "Daguerreian Miniature Gallery." Brady had mastered the process so thoroughly that he could produce several different pictures from one sitting, which helped the growth of his business. He also won medals every year from 1844 to 1850 from the American Institute of Photography for the quality of his pictures. Brady once said that "the camera is the eye of history." With this in mind, in 1845 he began to build a vast collection of portraits, which he named The Gallery of Illustrious Americans. Two years later he opened a studio in Washington, D.C., so that he could have portraits made of presidents, cabinet ministers, congressmen, and other government leaders. The book, published in 1850, was intended to be the first in a series, but it was a failure, and no more editions were made. was put in charge of the gallery in Washington in 1858. Perhaps the most famous of Brady's portraits was the standing figure of Abraham Lincoln (1809–1865) taken at the time of his Cooper Union speech in 1861. Lincoln is reported to have said that the photograph and the speech put him in the White House. When the Civil War broke out, Brady decided to make a photographic record of it. The project was a bold one. At his own expense he organized teams of photographers—in his biography James D. Horan states that there were twenty-two of them. Each was equipped with a traveling darkroom, for at that time the pictures had to be processed on the spot. Brady later remembered that he spent over $100,000 and "had men in all parts of the Army, like a rich newspaper." When the war ended, the collection comprised some ten thousand negatives. The project had cost Brady his fortune. He could not afford to pay the storage bill for one set of negatives, which were sold at auction to the War Department. The Anthony Company, a photographic materials dealer, seized a second collection for nonpayment of debts. Today Brady's large and brilliant historical record is divided between the National Archives and the Library of Congress in Washington, D.C. Although Brady maintained his Washington gallery, he never fully recovered from his business losses. In 1895 he planned a series of slide lectures about the Civil War. While he was preparing them in New York, he became ill and entered the Presbyterian Hospital, where he died on January 15, 1896. Hoobler, Dorothy, and Thomas Hoobler. Photographing History: The Career of Mathew Brady. New York: Putnam, 1977. Sullivan, George. Mathew Brady: His Life and Photographs. New York: Cobblehill Books, 1994.